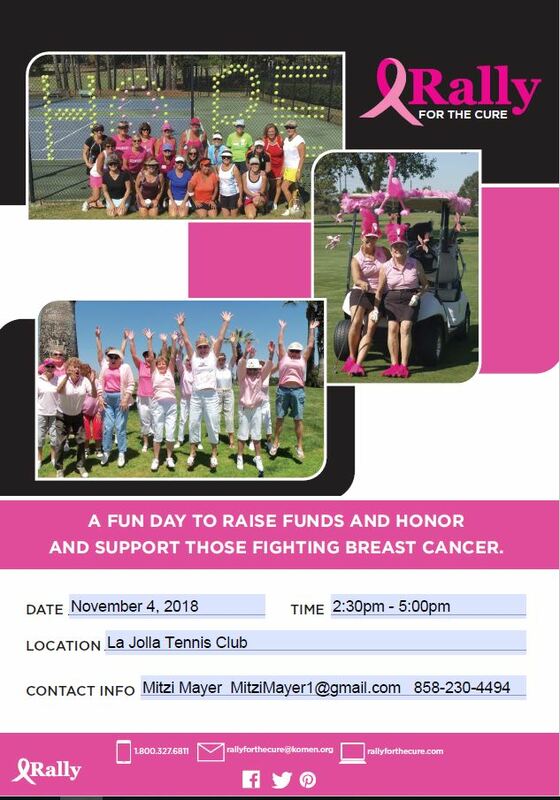 Consider taking part in La Jolla Tennis Club’s annual Rally for the Cure event benefiting Susan G. Komen San Diego on Sunday, November 4! It is a fun day to raise funds as well as honoring and supporting those fighting breast cancer. The registration fee is only $25.00! All registration fees and donations benefit Susan G. Komen San Diego. Komen San Diego’s work is about improving the law, changing systems, removing barriers and most importantly, elevating the women and men directly impacted by breast cancer. Komen San Diego provides free mammograms, biopsies, ultrasounds, care coordination, education and financial assistance for breast cancer patients’ most critical needs during treatment. For more information or to register, please call Mitzi Mayer at 858-230-4494 or email her at MitziMayer1@gmail.com.